Animal Law: what VGT has achieved in Austria! Note: The contents in words and pictures of this article are based on the facts when it was first published (11.12.2007). The exploitation of nonhuman animals is so vast in society that any progress in the law seems to be either impossible or so minor that it could even be called counter-productive. This can happen because a slight improvement of no significance in animal law, will make no difference for the animals, but can be used by animal industries to promote their products and calm the conscience of consumers. Such laws therefore are bad news for the animals. It was considerations like this which prevented VGT from getting involved in the process of campaigning for better laws at the start. The mud of everyday politics is not to everybody’s liking. Well-being and life of nonhuman animals protected by constitution. This change in constitution has, however, not been put in place so far (end of 2007) by the government. §25 (5) TSG says: It is forbidden to keep fur bearing animals in order to produce fur. In November 1998, we achieved the closure of all Austrian fur farms in practice. The last fur farmer was compensated and moved on into the Czech Republic to found the largest mink farm there. In 1998, the fur farm ban was a complete ban only in 6 of 9 provinces. In the remaining 3 provinces, such strict conditions for fur farming were put in place that no fur farm could be commercially viable. In 2005, the law was extended to the whole of Austria and now bans fur farming of all fur bearing animals, full stop. The ban essentially says that is illegal to keep any animal for the sake of retrieving his or her fur. The Austrian ban had a ripple-on effect for many other countries, especially England, Wales and Scotland. §27 (1) TSG says: In circuses and similar situations, it is forbidden to keep any wild animals or to use them for shows. §4 (4) TSG says: Wild animals are all animals, who are neither pets nor farm animals. In 1996, VGT started a campaign against animal circuses. During the years till 2002, there were demos almost everywhere outside those circuses. When the campaign shifted towards achieving a ban, it was focused on wild animals only as a compromise. In 2003 the ban was put in place and in 2005 it took effect. Till August 2005, there was still an Austrian circus using wild animals, since the circus did not consider a fox, a snake and yaks as wild animals. However, eventually the ban was enforced. Today there are no circuses using wild animals in Austria. The remaining animals in circuses are mostly horses, camels, cattle, pigs and dogs. In 2006, German circuses tried to instigate procedures by the EU Commission against the Austrian wild animal circus ban, since they felt that the fact that they could use wild animals in Germany but not in Austria was contrary to the freedom of provision of services in the EU. A concerted VGT-led EU-wide campaign persuaded the commissioner otherwise within 7 months. a. It is forbidden to build or use such cages. b. Cages built till 1. January 2003 can be used till 31st December 2008.
a. It is forbidden to build or use such cages from 1st January 2005 onwards. b. Cages built before 1st January 2005 can be used for 15 years from the date of their first usage onwards. In 2003, VGT decided to start an all-out campaign against hen batteries. Those cage systems had become the epitome of animal abuse in Austria. In the 1980s, virtually all eggs in Austria were produced in cage systems. Animal groups made the public aware of hen suffering in those cages then. In 1994, VGT could show by using UV light that 25% of eggs marked “free range” or “barn egg” were actually produced in hen batteries. It was then that the supermarkets decided to introduce a control-scheme that made sure that such betrayal could not happen again. The supermarket chain Billa actually stopped selling battery eggs altogether. In 2003, visits by animal rights activists in 48 battery farms keeping 40% of battery hens revealed the atrocious suffering of the hens and that many welfare regulations were being broken. Politicians and animal industries replied to the cage ban campaign that they would introduce enriched cages. However, VGT and the Austrian animal rights movement were not content with this. Under the rally cry “a cage is a cage”, eventually a complete ban was achieved. Politicians and animal industries then tried to make the ban unworkable by not promoting eggs from other than cage production and by making no effort to achieve consumer awareness of the imminent ban and of alternatives. The aim was to show that consumers would not buy more expensive eggs and hence that the cage ban would be the end of egg production in Austria. Consequently it would have to be revoked. In order to safeguard the ban, VGT persuaded all supermarkets to stop selling battery eggs. Many companies using industrial eggs either changed to other than cage produced eggs or to vegan alternatives. Eventually it became clear that the ban actually would be practicable. 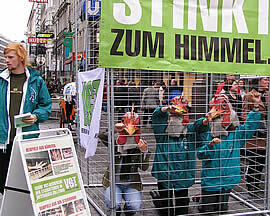 By the end of 2007, only 20% of laying hens in Austria were in battery cages. Imports of cage eggs make up 30% of all eggs used. By changing to cage-free systems, about 40% of hens were not restocked. The higher price of non-cage produced eggs has not been handed on to the customers yet. §41 (1) TSG says: Each province has to appoint an animal solicitor. §41 (3) TSG says: The animal solicitor represents the interests of animal protection. §41 (4) TSG says: The animal solicitor has legal standing in all cases concerning the animal law. He or she has the right to see all legal documents of cases concerning the animal law and the right to get all relevant information. He or she must be supported by all government bodies in doing his or her duty. The primary shortcoming of animal law was always its execution. Again and again investigations showed that animal law was ignored by official inspectors and that reports to the authorities were either not followed up or the animal abusers were pre-warned. 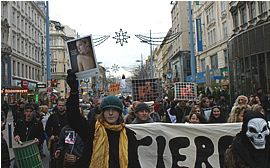 Therefore, one of the most basic demands of the animal rights movement in Austria always was to have some person or institution take up cases on behalf of animal victims. In 1996, the movement forced a public referendum, which was supported by 14% of the electorate. For such a referendum, those people supporting the demands have to go on their own accord to their magistrates and officially sign the referendum sheet. That 14% of the electorate (i.e. 460,000 people) actually did this, was hailed as a big success. One of the three demands of the referendum was that an animal solicitor scheme should be introduced. In Austria there is already an institution called people’s solicitor, which takes up cases for people against authorities and which is considered very helpful. The new animal solicitor institution was formed in a similar way. While much of the original problem of animal abusers not being held accountable, still persists, there have been some successes and the scheme itself is increasingly becoming more valuable. The utility of an animal solicitor stands and falls with the person holding this position. Somebody not interested in taking up cases, obviously will not do so. He or she cannot be forced. In principle, however, the idea to have solicitors for nonhuman animals is revolutionary. What distinguishes humans from other animals in the law on the most basic level is that the former are considered persons, the latter things. And as a thing, a nonhuman animal him- or herself could not have legal standing or be represented in court. The animal solicitor is now able to represent the interest of society in animal protection in court, and in this way take the side of the animal victims. He or she can appeal against animal abusers being found not guilty, he or she can force authorities to act on behalf of nonhuman animals and can at least collate all information on animal law being applied, in this way uncovering shortcomings of the law. Well-being and life of nonhuman animals protected by constitution. The state protects the life and well-being of animals due to the special responsibility humans have for their fellow creatures. This change in constitution has, however, not been put in place so far (end of 2007) by the government. 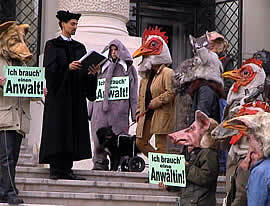 To have the protection of life and well-being of nonhuman animals in the constitution has been a primary demand by the Austrian animal rights movement for a very long time. The public referendum in 1996 was also pleading for this change. The constitution sums up the basic values of society. No law and no political act can contravene the constitution. Every year there are a large number of court cases regarding nonhuman animals. Each and every of these cases can make use of such a constitutional change to move society further towards respecting animal rights. This statement in the constitution will not, by itself, save an individual animal. But it will be the most powerful source for change on all levels of society on the long run. That ranges from the right to protest for animals, to the size of fines for animal abuse, applications for animal experiments, government funding of animal welfare, animal rights curriculum in schools or the establishment of new animal laws. §3 (6) TVG says: Experiments on members of all species and subspecies of chimps (Pan troglodytes), Bonobos (Pan paniscus) and Gorillas (Gorilla gorilla spp), as well as of all species and subspecies of the family of Orang Utans (Pongidae) and Gibbons (Hylobatidae) are forbidden. In the 1970s and 1980s, more than 50 wild caught chimps were –often illegally – imported into Austria to be used for vivisection. In 1999, those experiments were stopped since they had not led to any advances in AIDS or hepatitis. In 2002, 44 chimps were rehabilitated from the last Austrian chimp lab. It was time to get a ban on experiments on apes. For this campaign, the legal channels were used. The commission for advising the animal minister regarding the law on vivisection was persuaded to invite 2 experts on ape experiments on the question of a possible ban. The citizens’ initiative council in parliament was handed a petition demanding an ape ban. Eventually, the Green Party put a bill on banning experiments on apes to parliament. This bill was approved by the majority in parliament on 10th December 2004. In 2005, the government introduced a bill that excluded gibbons from the ban. After intense debates and lobbying, the government bill was amended to include gibbons. On 7th December 2005, parliament agreed to the bill. On 21st December 2005, the upper chamber in parliament accepted this. From 1st January 2006 onwards, all experiments on all apes, including gibbons, are banned in Austria. That is quite a significant step politically, since it essentially says that apes cannot be harmed in the slightest way, even if it was to save humans from certain illnesses. Medical procedures can only be applied to apes, if it is in their own interest, similar to the case of humans. A total ban on ape experiments, i.e. including Gibbons, exists no-where apart from Austria. New Zealand, Sweden, Holland and Japan have bans on experiments on Great Apes, i.e. excluding Gibbons. §18 (3a) TSG says: From 1st January 2012 onwards it is forbidden to keep rabbits in cages to produce meat. 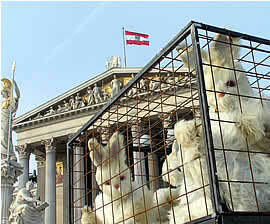 In April 2007, the true horror of rabbit farming in battery cages in Austria was made public. In consequence, supermarkets banned rabbit meat from their shelves. In August 2007, a campaign to get rabbit cages banned was decided upon. In early November, the government conceded that a change in law was necessary, although they only suggested enriched cages with plastic floor and structures. A frenzied intensive campaign by VGT and other groups was eventually successful. On 4th December 2007, the majority in parliament agreed to the new cage ban. The rabbit cage ban for meat production includes the keeping of rabbits in wooden hutches. In the future, rabbits for meat production must be kept on the floor in a way that they can run and hide and jump, and that there is no “lid” or “roof” above their heads. Just putting straw in a wooden box is definitely not enough to evade the ban. The keeping of rabbits for fur production has already been illegal in Austria since 1998. The rabbit cage ban takes effect in 2012 and will affect about 300.000 rabbits. According to ministry numbers, by the end of 2007 there were 23 rabbit cage batteries for meat production in Austria. However, there is an exception for recently built (since 2005) cage batteries, for which a longer phase-out till 2020 will be put in place. This is the most serious set-back of this new law. It means that one rabbit battery farm will continue till then, and another, which has just ordered new cages (being aware that the cage ban will become law by 1st January 08 and that there is an exception for newly built cages), may also continue till then. So, at least one if not two rabbit cage battery farms will stay in operation till 2020. The ban also includes keeping rabbits temporarily in cages or wooden boxes. This means that even if the farmer puts the rabbits out into an open enclosure during the day and only into wooden boxes during the night, it would be illegal.